Click on the link below to enter your voting results. The survey must be filled out by a teacher, teacher-librarian, librarian or parent of eligible voting readers. See our voting page for all the details. Readers wishing to vote in person may visit any branch of the Winnipeg Public Library or McNally Robinson Booksellers to cast a ballot. Voting is open between March 18 – April 10, 2019. To celebrate reading, teachers, parents or students are invited to enter our Love Notes contest. 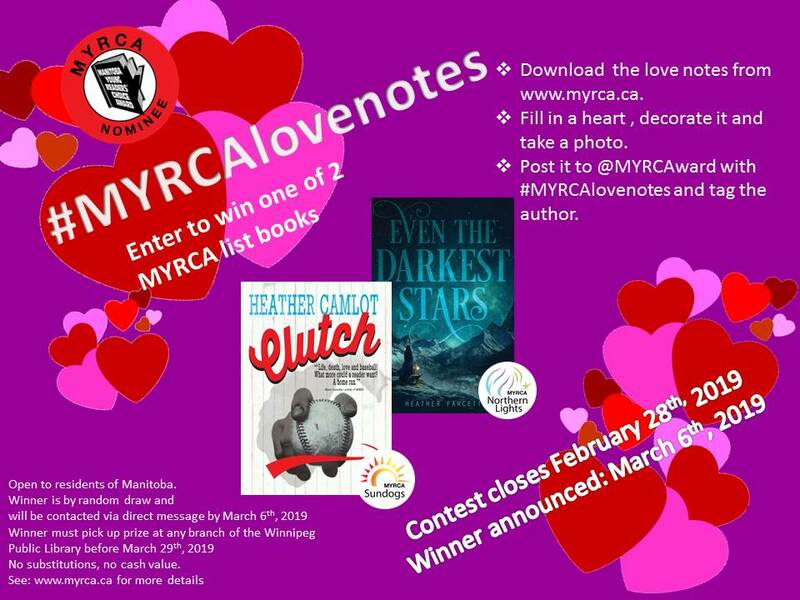 Win a MYRCA list book by downloading our #myrcalovenotes and filling out the heart with your favorite MYRCA character. Decorate your heart and take a photo, then post it to @MYRCAward ‘s Instagram or Twitter account using #MYRCAlovenotes. Tag the author to spread some added love! Contest runs from February 1-28th, 2019 and is open to residents of Manitoba. Winner is selected by random draw and will be notified via direct message. Winners must pick up their prize at any branch of the Winnipeg Public Library before March 29th, 2019. Looking for some writing activities to do with your class? How about having your students write reviews about MYRCA books? Students can post their reviews on this very site! 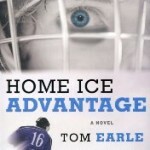 Go to our Sundogs or Northern Lights pages and click on the book covers. This will lead you to a page where your students can post their reviews. 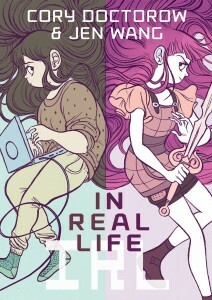 Teacher and librarians of MYRCA bookclubs are eligible to win one of three question and answer Skype visits with authors Marina Cohen, Heather Camlot and Adrienne Kress. Enter by posting a photo of your MYRCA club with their books on social media, either Twitter or Instagram. Visit our contest page for all the details and rules. MYRCA sends a huge thank you to Marina, Heather and Adrienne for their generosity! We can’t wait to see all of your posts! 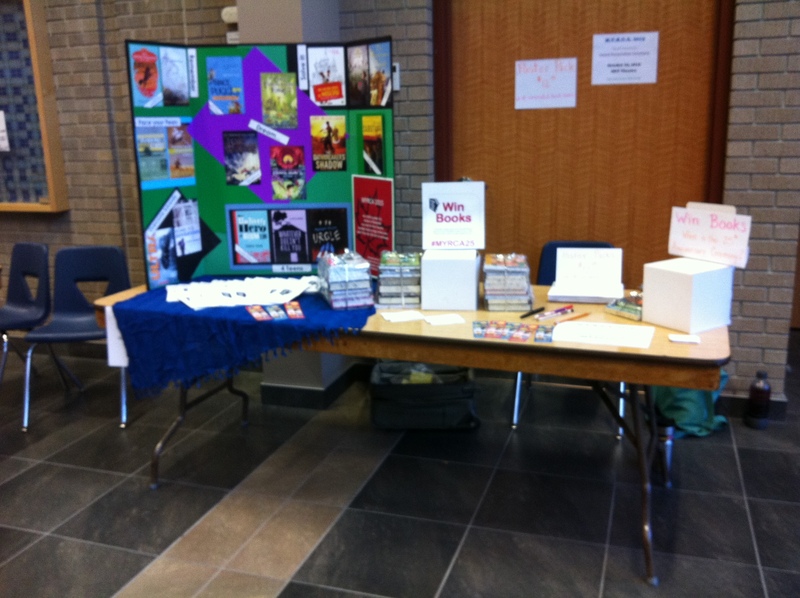 The MYRCA committee is very pleased to announce the winners of the MYRCA Books in Box Program. Our grant from the Thomas Sill Foundation was enough to cover not one but four schools and we are thrilled to be sending the following schools MYRCA books for the next three years in the hopes of expanding the awards into rural Manitoba. The Judging committee took into account the applicant’s plans to implement a MYRCA program, the value they placed on Canadian content, their interest in voting and their lack of access to bookstores. MYRCA would like to thank all of the schools for applying. We understand the need for more books in schools and the budgetary constraints small school libraries face. We plan on continuing our efforts to find grants that will help us put books in your student’s hands. Check back with us often or follow us on Twitter or Instagram for all the latest news. The 2019 MYRCA Sundogs and MYRCA Northern Lights poster packs are now available at McNally Robinson Booksellers on Grant. Each set of 10 posters retails for $7 and there are a limited number at this time. Thank you for your patience! The 2019 MYRCA Pamphlet is now ready to download and share, please fold it accordion style. You can find it and other resources on the Resources page. We are still working on printing bookmarks and poster packs which will soon be ready for sale at McNally Robinson Booksellers on Grant in Winnipeg. Thanks for your patience! The MYRCA committee is currently reviewing the Books in a Box applications. We received 33 applications and are thrilled with the response. It is heartbreaking to see how many schools need more books but we are happy to be able to provide the MYRCA list(s) to one rural school for the next three years. We will be applying for more grants and will hopefully be able to continue this great initiative. Please stay informed by signing up for our newsletter. Today is the day! Celebrate Canadian Children’s Book Week by looking over our 2 brand new lists for the 2019 Manitoba Young Readers’ Choice Awards. 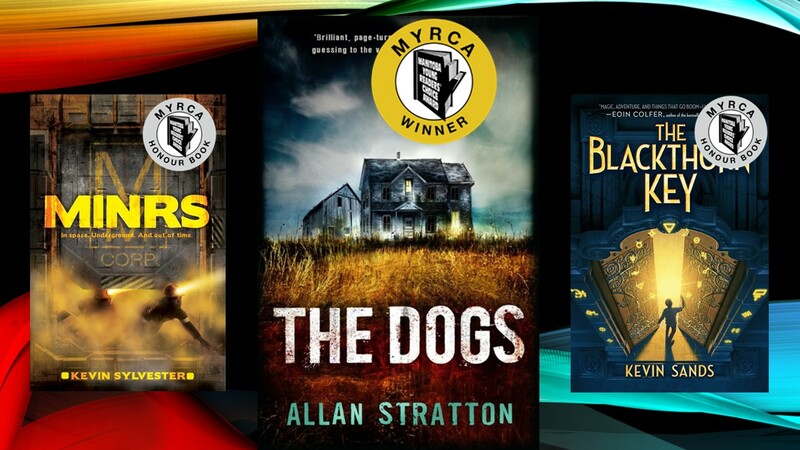 The MYRCA Sundogs nominees are perfect for students in grades 4-6, if they read 3 books, they may vote once and if they read 6 or more, they may vote twice! For older students in grades 7-9, the MYRCA Northern Lights nominees has books for their interest level. Same voting rules apply. We would like to thank our many publishers who send us reading copies every year to help us select the lists. They make MYRCA possible and we are happy to promote them to all Manitoba schools. We are thrilled to announce the winner of the 2018 Manitoba Young Readers’ Choice Award. Congratulations to Wesley King for his novel, OCDaniel! We would also love to congratulate Honour Book Winners: Caroline Pignat for Shooter and Faith Erin Hicks for The Nameless City. We look forward to meeting Welsey King in the fall when he will receive his award during Thin Air, The Winnipeg International Writer’s Festival. Voting is now closed. check back soon to find out who is the winner! Voting is now open for the 2018 Manitoba Young Reader’s Choice Award and will run until April 11th, 2018. Enter your votes here: VOTE NOW! If you need ballots or Vote Summary to help calculate how many times a book has been read, just click on the links or visit our Voting page for more information. We know you are all wondering about the results of our MYRCA Name It contest. We will be ready to announce the winners soon! With less than an hour to go before voting closes in the Name It contest, it has been a tight race between Purple Crocus/White Crocus and Dreamcatcher/Northern Lights. We would like to thank all of the people who suggested names and all of the voters for taking an interest in MYRCA. Paper ballots still need to be counted, they were available at McNally Robinson Booksellers, Headingly Library and all branches of the Winnipeg Public Library. Once we add those ballots to the online totals, we will announce the winning suggestions. Welcome to I Love to Read month! MYRCA is thrilled to announce that we have selected our top 5 choices for the Name It contest. Congratulations to Sheryl Hunnie, Niki Card, Sandy Welbergen, Darlene Bromley, Karen Kendrick, Karen Burkett and Kelly Wood for sending in their wonderful suggestions. Please visit our Name It Contest page to vote for your favorite or visit McNally Robinson Booksellers, the Headingly Library or any branch of the Winnipeg Public Library to fill out a ballot. The voting phase closes on March 5th, 2018 so celebrate I Love to Read Month by naming our new awards! Hello readers! We are happy to report that we have received12 entries in our MYRCA Name It contest. The suggestion phase closes on February 2nd, so for those of your thinking of entering, please do so soon! We also have some wonderful news to share with you. MYRCA has been given a grant by the Thomas Sill Foundation to promote MYRCA in our rural districts. We are currently looking for a school outside of Winnipeg to partner with who would be interested in running a MYRCA book club for the next 3 years and we will be able to provide you with list books (and shipping) at no charge. Fill out the application form on our Books in a Box page to be considered. Happy New Year to all our readers! You can welcome 2018 by helping us to name our new awards! Simply visit our MYRCA name It! Contest page to view the contest rules and enter your suggestions. The contest is open to adults who teach or have children in grades 3-9. Librarians and Teacher-Librarians may also enter as long as they serve students in grades 3-9. The MYRCA committee will select their 5 favorite suggestions (per award) and then the public is invited to vote for the names they love the best. So check back here often to see the progress. The winners of the vote will receive a complete set of 2019 MYRCA list books for their school, class, library or family. Good luck to everyone! we look forward to reading all of your ideas! As you may have already heard, the MYRCA award will be expanding into two awards starting next year! One award will be geared for grades 4-6 with 10 books on the list, the other award will be for grades 7-9 and will also have 10 books on the list. Students who read a minimum of 3 books will be able to vote for their favorite. But, we need your help! We need new names! What should we call our new awards? Well, looking around Canada for inspiration, there is the Forest of Reading in Ontario that uses tree names for their awards; examples include the Red Maple Award, Silver Birch Award and the White Pine Award. Over in Saskatchewan, they have the Willow Awards where they use the Shining Willow and the Diamond Willow to distinguish age groups. Farther west, we find the Rocky Mountain Award (Alberta) and the Red Cedar Award (B.C.). So there seems to be a trend in naming awards after trees and geographic features. But the MYRCA directors have decided to leave it up to you! If you are a parent, teacher or librarian who has students in grades 3-9, we want to hear your suggestions! Starting January 2nd until February 2nd, 2018, eligible adults will be able to submit their children’s suggestions to the MYRCA committee via email. On February 7th, 2018, and through the rest of I Love to Read Month, students will be able to vote on their favorite names from a short list of 5 suggestions provided by you! On March 7th, we will announce the new names and award prizes for the winning suggestions. The school/class/library or family who provided the winning suggestion will receive a complete set of the 2019 MYRCA list books. There will be one set of 10 books for the grades 4-6 list and one set of 10 books for the grades 7-9 list. Full contest details will be posted on www.myrca.ca for the duration of the contest. We sincerely hope you will be able to come up with some fantastic ideas; we are ready and willing to consider them all. You can keep up to date on all the latest news by subscribing to our newsletter (the link is on your right), by following us on Twitter, Instagram and Facebook or by checking this website regularly. So stay in touch, it’s going to be a memorable year! Hopefully you have already heard the good news through Winnipeg Public Library’s Reader’s Salon but if not… there is a big change coming to Manitoba for its young readers! Lately, the MYRCA committee has noted the difficulty in finding appropriate titles for the full range of ages we serve. Students’ reading interests in grade 5 are vastly different than students in grade 8. The same holds true for their reading level. 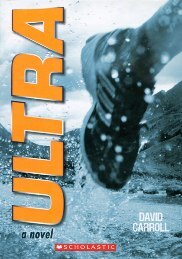 Having a long list of 18 books, MYRCA selectors have always hoped that there is something on it for everyone, but in reality, there are always a few books that are too “low” for the grade 8’s and too “high” for the grade 5’s. With this in mind, MYRCA has decided that now is the time to change! Starting in 2019, MYRCA will offer two lists of 10 books each; one for grades 4-6 and one for grades 7-9. In this way we are expanding our readership into grades 4 and 9 and will be offering titles that are better suited to them. MYRCA voting system will remain the same, participants may vote once if they read 3 or more titles and twice if they read 6 or more. Teachers and librarians report this to be very motivating to their students, many will read “just one more” to get that extra vote. In these ways, MYRCA hopes to encourage all young people to become readers for life. Although this change is still a year away, you can still participate in this year’s MYRCA. 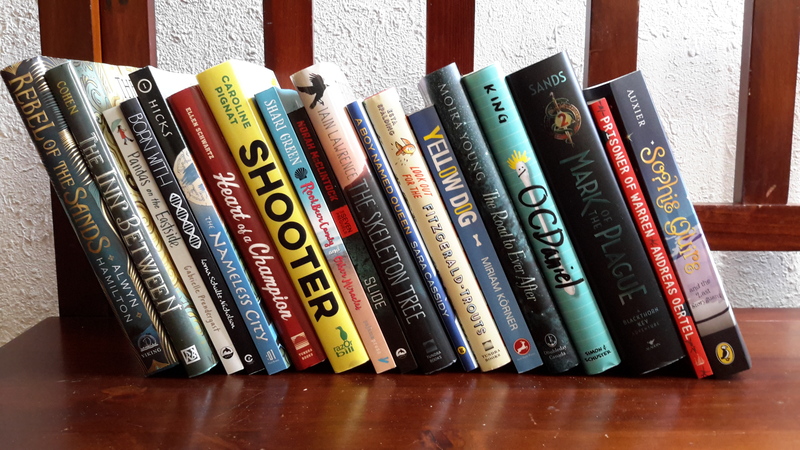 You can start reading the fantastic titles on the 2018 list of nominees in several ways. If you like good old-fashioned print books, Winnipeg Public Library has all of the titles in hardcover or paperback . If you live outside of Winnipeg, the technology-oriented can borrow the E-books through ELibraries Manitoba . If you need a great read-aloud for that long summer road trip, you can do that too! Kids only have to have read (or been read to) 3 nominees to be eligible to vote. For 2017, Manitoban students chose Allan Stratton’s The Dogs as their favorite book. Our kids clearly have good taste; The Dogs has won both Saskatchewan’s Snow Willow Award and Ontario’s Forest of Reading’s Red Maple Award. This September, MYRCA together with Thin Air, the Winnipeg International Writer’s Festival have arranged to have Allan Stratton appear on their main and school stages. Young readers never forget meeting their favorite author and their energy is palpable. Schools whose students have voted are also invited to a special ceremony when Allan will receive his 2017 MYRCA Award, hosted by Lisa Ferguson’s students from Victor Mager School. Voting Schools received a save the date email in June and will receive confirmation email in September. Email myrcaward@gmail.com for more information. The new 2018 list is out! Check out the titles on our 2018 Nominees page . Congratulations to all the authors and publishers for giving us the opportunity to select from such high quality Canadian books. We hope you love them as much as we do! Print out our MYRCA pamphlet 2018 to promote the list in your school or library! 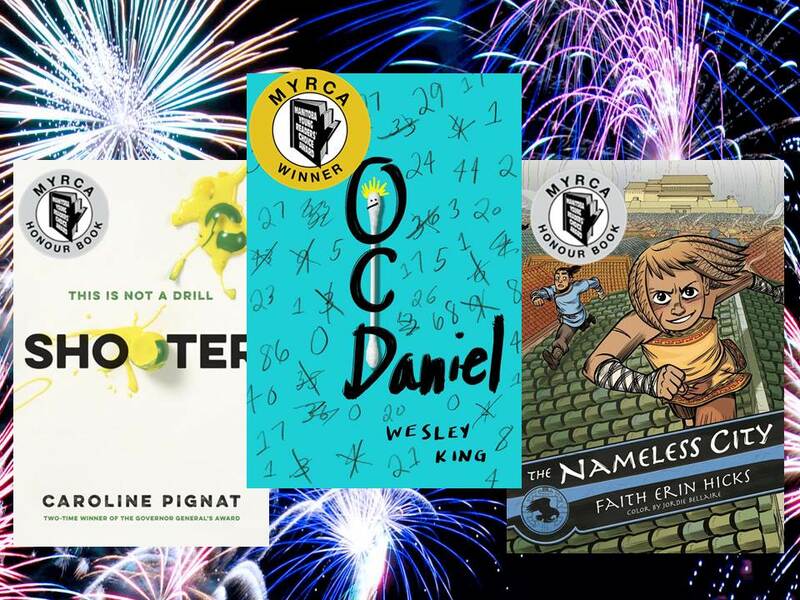 Here are Manitoba Young Readers’ favorites! Voting is now closed for the 2017 MYRCA. Voting for the 2017 Manitoba Young Readers Choice Award is now open until April 12th, 2017. Families may vote in person at McNally Robinson Booksellers in Winnipeg or at any branch of the Winnipeg Public Library. CLICK HERE to find your nearest branch and hours of operation. Do you live in rural Manitoba? Do you need to get your MYRCA books read? Are they all checked out at your local libraries? MYRCA is proud to be partners with ELIbraries Manitoba and we are pleased to announce that they have purchased all the MYRCA titles that are available as Ebooks. Check out the links to the Ebooks on our 2017 Nominees page. Winners of the I love to Read Retweet to Win contest have been notified. Thanks to everyone who participated in the contest. The 2017 MYRCA Reader Ballot is now available to download. Click on the link or find it under the Voting tab. The 2017 MYRCA vote summary is also available to help you calculate how many times the 2017 Nominees have been read and how many votes they received. Voting opens on March 20th, 2017. Watch this page for the online link to enter your votes. 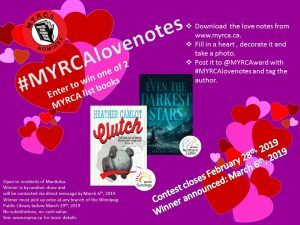 Celebrate I love to Read month by entering our 2017 MYRCA Nominees Retweet to Win Contest. Visit and follow us @MyrcAward on Twitter. Watch for the “Retweet to Win” tweet and retweet it to your followers to be eligible to win. Contest open to residents of Manitoba, over the age of 18. Contest open until February 28, 2017. Winner will be notified via Twitter and must pick up the books in person at any branch of the Winnipeg Public Library by March 7th, 2017. YA Pack: 1 copy each of We are all Made of Molecules, Prison Boy and Scorpion Rules. 30 MYRCA bookmarks and a Winnipeg Public Library bag. 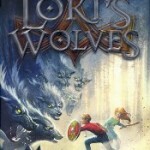 Middle Grade Pack: 1 copy each of The Dogs, The Blackthorne Key and MiNRS. 30 MYRCA bookmarks and a Winnipeg Public Library bag. Welcome back to school teachers and students! 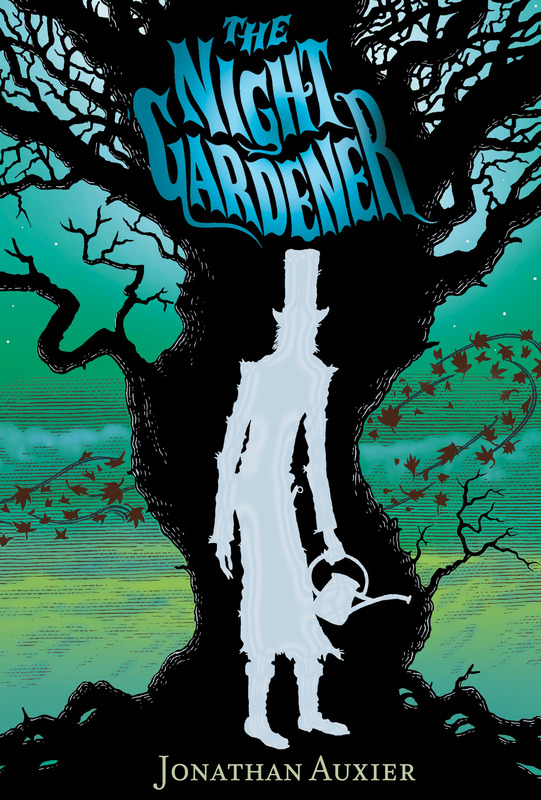 We know you will have a wonderful reading year ahead of you with all the new MYRCA titles to enjoy. Check out the new list on our 2017 Nominees page! A big thank you to all the great photos readers send in to us over the summer. Looks like the MYRCA list traveled far and wide this year! Follow us on Twitter to see all the exciting photos! We are busy planning our 2016 MYRCA Award ceremony with special guest Kenneth Oppel. He will be receiving his award on Friday, September 30th at MTYP. Voting schools will be notified this week with info about how to get tickets. Check out our Awards page for the latest details. We are very pleased to announce that we are partners with Thin Air, the Winnipeg International Writer’s Festival this year. They will be hosting 2016 MYRCA winner Kenneth Oppel and 2017 MYRCA nominee Kevin Sylvester on their school stages. Also appearing at the festival is Frank Viva, whose book Sea Change is a contender for the 2018 MYRCA list. We urge you all not to miss out on this incredible opportunity to visit with some of our Canadian literary stars. MYRCA Books available as eBooks! If you are heading out of town or staying in on a rainy day, you can download your favorite MYRCA titles as eBooks or audiobooks from Winnipeg Public Library’s Overdrive website, available for free with your Winnipeg Public library card. If you are not a resident of Winnipeg but have a library card from your local Manitoba library, eLibraries Manitoba has some MYRCA titles available as eBooks to download as well. We are busy making preparations for the 2016 Award Ceremony! Mr. Kenneth Oppel is confirmed as our special guest and will be hosted by the students from Beaumont School. The ceremony is by invitation only for students who have voted for the 2016 MYRCA. The ceremony will take place on Friday, September 30th, 2016. 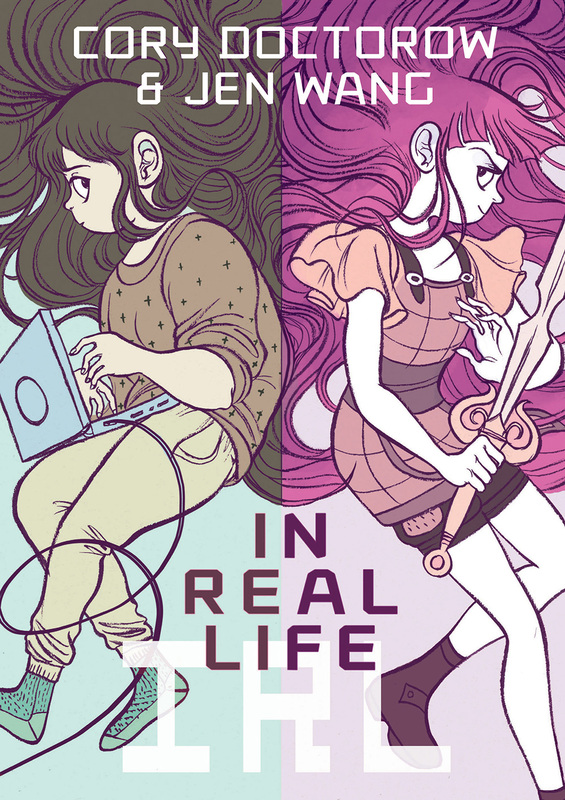 This year, the MYRCA committee is proud to partner with Thin Air, The Winnipeg International Writer’s Festival who will also be hosting Ken Oppel on their school stages on Thursday, September 29th, 2016. A “Save the Date” email was recently sent out to all the voting schools . There have been some issues with teachers/librarians who are not able to fill out the form. If you do not have a Google account and are having trouble with the form, please email myrcaward@gmail.com and we will take your information via email instead. Thank you! The nomination process for the 2016/2017 MYRCA committee is now closed. We had a lot of responses and are currently going through the applications. Candidates who applied will be emailed early next week. The MYRCA committee is currently looking for new members. If you are an adult who loves to read, have a professional interest in children’s literature and are available to attend monthly meetings, email us myrcaward@gmail.com for more information. Deadline for application is May 20th, 2017. It’s been a very busy time for all of us here at the MYRCA committee. But, the new list has been announced! Visit our 2017 Nominees page for the list of nominees. We would like to thank all of our publishers who send us reading copies every year, making it possible for us to select the list. It is with greatest pleasure that we announce the winner and honour books for the 2016 MYRCA Award. Congratulations! Voting for the 2016 MYRCA award is now closed. Keep watching this space or follow us on Twitter for the big announcement. We will post the winner and honour books after we contact the authors. Thanks for your participation. Voting school will be contacted for invitations to the Award Ceremony to be held in September. Teachers and Parents: Enter your class or child’s vote by clicking on the Vote Now link above. You may only use the link once per IP address. Voting will remain open until midnight April 13th, 2016. Good luck to all our authors! The voting period is set to begin on March 21st and runs until April 13th, 2016. All children in grades 5-8, residents of Manitoba, may vote for their favorite Canadian book from the list of 2016 nominees. Readers who have read 3 or more may vote once, readers who have read 6 or more may vote twice and readers who have read 15 or more may vote three times. Check our Voting Page for all the latest information. Voting will be done online as it was last year. Parents and Teachers may log on to the link during the voting period to enter the votes. The link will be available on this page on March 21st, 2016. There is no need to pre-register. Votes are also being taken in person in all branches of the Winnipeg Public Library and at McNally Robinson Booksellers on Grant during the voting period of March 21st to April 13th, 2016. Votes will no longer be accepted after midnight on April 13th, 2016. Only classes and families who vote during March 21st and April 13th will be invited to the 2016 Award Ceremony in September. Congratulations to the winners of the Retweet to Win Contest! 2016 MYRCA Nominees Retweet to Win Contest. Visit and follow us @MyrcAward on Twitter and retweet the photos to win the books for your class or child. Contest open until February 22, 2016. Winner will be notified via Twitter and must pick up the books in person at any branch of the Winnipeg Public Library by February 26, 2016. 1 copy each of Outside In, The Boundless and Bye-Bye Evil Eye. 1 copy each of A Day in the Life of Total and Complete Genius, The Comic Book War and Missing in Paradise. Enjoy the updated and corrected Powerpoint presented at the MYRCA Award Ceremony with updated pictures of our winners with Ace. Well the good news is: our 25th Award Ceremony is full. All 600 seats are accounted for and we are looking forward to greeting all of our readers, local and winning authors, teachers, librarians and sponsors in person. We have a special guest lined up to be our Master of Ceremonies and it is none other than 103.1 Virgin Radio’s Ace Burpee. We know it will be an unforgettable day! And the bad news is: if you were a voting school and did not receive our invitation, we are unable to accommodate any more requests for space at the ceremony. Email us at myrca@myrca.ca and we will put you on the priority list for next year’s ceremony along with our deepest apologies. Thank you to all our voters out there. Thank you to our sponsors who have given us the financial backing to support all of you. Thank you to all the teachers and librarians who support literacy. Thanks to the Public Libraries who promote MYRCA to the masses and most of all thank you to the Publishers whose contributions to MYRCA make it possible to select a list every year. MYRCA has grown through all of your efforts and we recognize and appreciate you! Happy Readings! Here’s to 25 more years! Stay tuned for some exciting news…we have confirmed a local celebrity to be our Master of Ceremonies for the Award Ceremony. We can’t wait to tell you who it is!!!! We sent out the confirmation emails for the Award Ceremony and Workshops on Monday September 14th. There is a lot of interest this year and we are very thankful to our teachers and readers who are making an effort to be part of our Canadian Stories celebration. If you have not received your invitation, please email us at myrca@myrca.ca. Welcome to the new and improved MYRCA website! We are very busy preparing for the fall. Here in Manitoba, October will be a very exciting month for young readers, authors, publishers, librarians, teachers and everyone who loves to read homegrown Canadian literature. Check out the Award Ceremonies page for all the details on who will be visiting and how you can participate. There is a little bit of something for everyone: be it a dinner, a conference or a book signing. We are most looking forward to awarding the 25th MYRCA to David Carroll and hosting our Honour Book winners Tom Earle and Kelley Armstrong. We are extremely grateful for all the support we have received from our Sponsors who have made generous contributions to our events. Be sure to save the date for the unforgettable memories about to be made! Check out the new resources on our 2016 Nominees page. You’ll find links to the available Teacher’s Guides for the 2016 MYRCA’s. Know of one that isn’t listed? Send us an email at myrca@myrca.ca to let us know and we’ll add it to the website. Voting schools have been notified to save their seats for the 2015 MYRCA Award Ceremony and the Millennium Library workshops on October 22, 2015.
will all be in attendance for the ceremony and will conduct workshops at Millennium Library in the afternoon. The events on Thursday October 22nd are by invitation only. 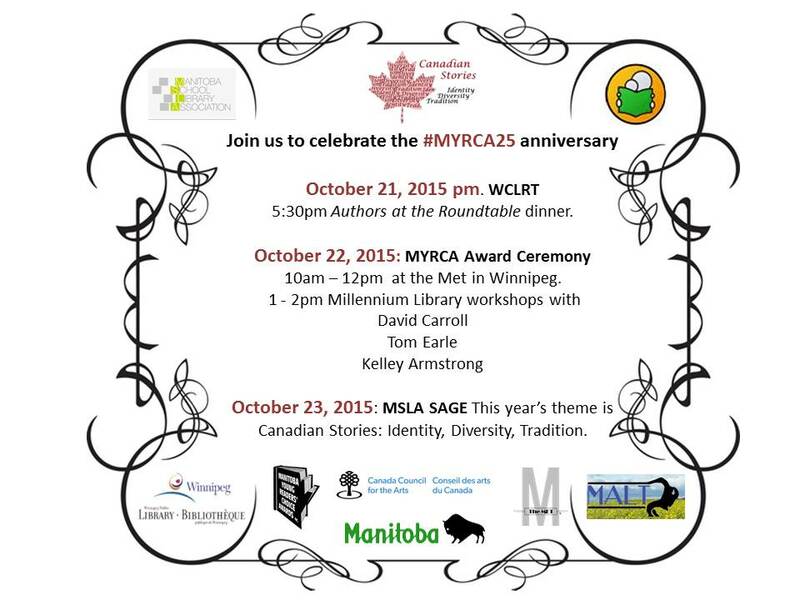 If you would like to meet the #myrca25 authors, please consider attending the events with our partners. Visit McNally Robinson Booksellers to get your sticker pack or ORDER NOW from the committee. Each pack has 18 red nominee stickers, 2 silver honour book stickers and 1 gold winner sticker and sells for $4. Perfect for tagging the books in your collection! We have heard your concerns! In our recent voting survey, teachers remarked how raising the minimum amount of books to read from 3 to 5 had a negative effect on some book clubs. In response, the MYRCA committee would like to announce new voting rules this year. The more nominees you read, the more times you can vote. In this way, we hope to encourage all young readers to participate. Thank you to everyone for your feedback! If you have any questions or would like to comment on the new voting rules, please visit the voting tab or click here. Click on the above book covers to leave a congratulatory message! Happy I Love to Read month to all our wonderful readers! We hope you will find time to get your 5 books read from the 2015 list. Voting begins in just 6 weeks! This year, voting will be done through an online survey. Students and children in grades 5-8, residents of Manitoba, can use the 2015 Reader’s Ballot to check off which books they’ve read and write in the title of the one they choose as the winner. Teachers and parents can use the 2015 Vote Summary to calculate the one they choose as the winner. Paper ballots can also be submitted in any branch of the Winnipeg Public Library or at McNally Robinson’s on Grant. Official ballots will be accepted between March 18th until April 4th, 2015. We are very happy to announce some exciting news: there is now a brand new MYRCA Bookclub at West Kildonan Library located at 365 Jefferson ave! Tweens who are available every 2nd Thursday of the month and interested in joining can call the branch at 204-986-4389 to register. Welcome to the MYRCA family! 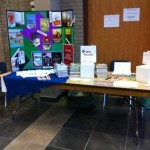 Teachers: we hope you had a chance to visit our table at SAGE. We gave away 3 large prize packs of books to Darcie Kiene, Lisa Weremy and Zoya Osipova for creating tweets for #MYRCA25. Join us on Twitter @MyrcAward to view their winning entries! In honor of our upcoming 25th anniversary, follow us on Twitter @MyrcAward for our new #Throw Back Thursday tweets. Every other week, enjoy a Committee selected favorite from our archives. Retweet your favorites with #MYRCA25. The 2015 Pamphlet with this year’s nominees is now available under the Resources tab. The 2014 MYRCA Award ceremony was a huge success thanks to all of our wonderful voters. École St-Avila debuted the Official Booktrailers for the 2015 list. Marsha Forchuk Skrypuch was delighted with her award and was gracious enough to sign bookmarks for every student in attendance. The 2015 Myrca Powerpoint has been updated with the “also nominated” stickers. Looking for ways to promote the 2015 MYRCA? Check out and download the 2015 25th anniversary MYRCA nominee poster found under the Resources Tab. The MYRCA Committee would like to thank Ecole Saint-Avila for graciously volunteering to create the official booktrailers for the 2015 list of Nominees. 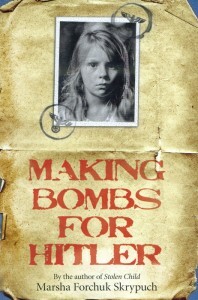 They will be launched at the 2014 Award Ceremony which will also honor Marsha Forchuk Skrypuch’s book Making Bombs for Hitler. The students will also act as MC’s for the event and present Marsha with her award on behalf of all the readers in Manitoba. Thank you so much Ecole Saint Avila! Click on the cover to leave a congratulatory message! Leave a message for our honour book authors by clicking the above titles. Monday, April 14, 2014 Voting is officially closed, thank you to all voters! We are very busy counting all those ballots… Please continue to check back for news about the winner. We will post A.S.A.P. Promise! In the meantime, click on the book covers of the current nominees to view the comments. You may be surprised at some of the entries! We are still accepting comments…tell us what you think! Who do you think will win? 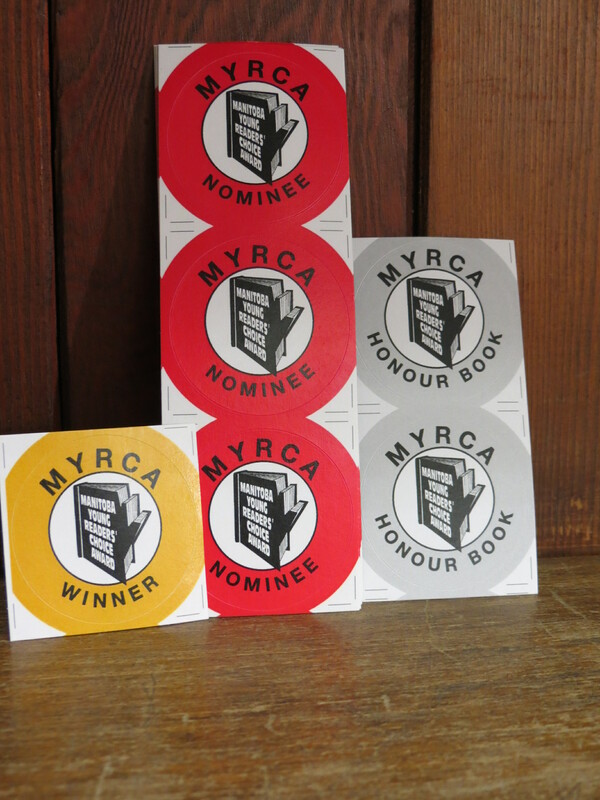 Follow us on Twitter @MyrcAward Good luck to all the authors! April 9th, 2014 Today is the last day to vote for the 2014 winner. Please return your completed vote summary by midnight tonight! Thanks! in McNally Robinson Booksellers on Grant! 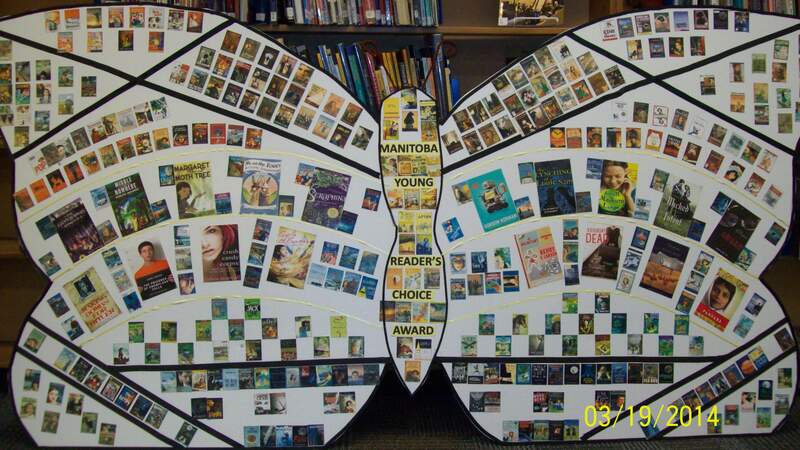 April 2014 Just look at what our friends at Acadia Jr. High have been up to…creating a butterfly including all but a few nominees since 1992! Amazing work! from our great readers at Acadia Jr HIgh. Time to start voting! If you have read 5 from the 2013 list of nominees and are a student living in Manitoba, between grades 5-8, it is time! You can vote through your school library, in any branch of the Winnipeg Public Library or (new this year) at McNally Robinson’s on Grant. You have until April 9th (midnight) to vote! Be sure to check out of the reader’s comments of your favorites; you can see them by clicking on the book cover. Tell us who is your favorite on Twitter using @MyrcAward. Happy Reading and Good Luck to all the authors! February News: I Love to Read Month Only 2 months left before the big Vote! The voting period this year will begin March 17th and will run until April 9th, 2014. Check under the Voting Tab for the latest instructions. All students in grades 5-8 may vote as long as they are residents of Manitoba and have read, or heard read 5 titles from the 2014 Nominated List. Happy reading! December News Thank you readers! Your comments have been pouring in lately. To view them: visit the 2014 Nominnees page and click on the book cover, it will open a new page where you may add your thoughts. November News 2013 M.Y.R.C.A. is pleased to announce that we are now on Facebook. Please like our page! October News Congratulations to the following schools who received copies of the MYRCA list due to the generous support of the Winnipeg Jets True North Foundation Grant. We are happy to welcome these schools as new MYRCA voting schools for 2014! September 2013 Enjoy the phenomenal 2014 MYRCA booktrailers, created by the talented students of Linden Meadows School for the 2013 Award Ceremony. Wonderful job! September 27,2013 The Myrca committee is very proud to have hosted a wonderful Award Ceremony and would like to congratulate Chris McMahen, winner of the 2013 Myrca Award. September 2013 Teachers…watch your in-boxes for this blue MYRCA flyer…see if you qualify to win Myrca List Books for your school! 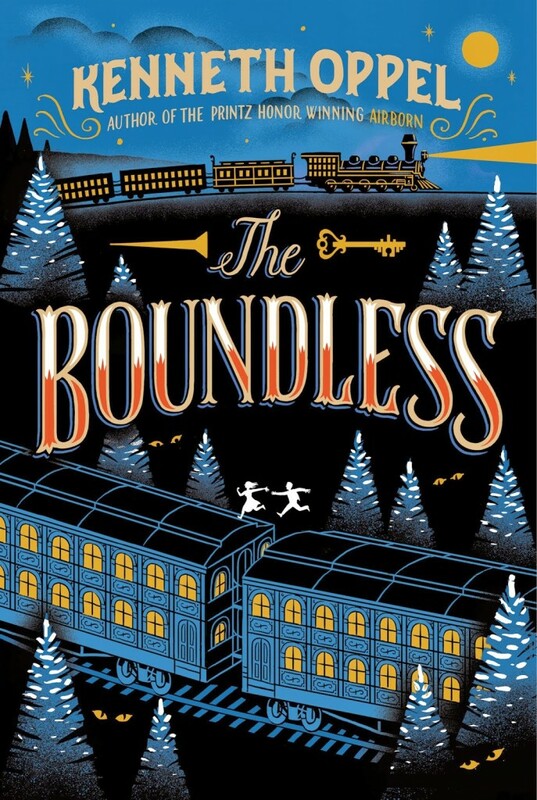 Friday, June 21, 2013 Why not make reading Myrca titles a part of your summer road trip? http://winnipegpublibrary.wordpress.com/2013/05/17/tween-road-trip-survival-guide/ Wednesday, May 1, 2013 List of 2014 MYRCA nominees is now available. MYRCA press release April 2013 Tuesday, April 24, 2013 2013 WINNERS ANNOUNCED! Box of Shocks by Chris McMahen wins the 2013 MYRCA, 2013 Honour Book awards go to Peter Nimble and His Fantastic Eyes by Jonathan Auxier and Undergrounders by David Skuy. Wednesday, April 10, 2013 Voting for the 2013 MYRCA winner closes today April 10, 2013. Make sure your vote counts by submitting it no later than midnight tonight. Check out the Voting tab for everything you need to participate in the 2013 vote. Sunday, February 24, 2013 Congratulations to the following schools who received copies of the MYRCA list due to the generous support of the Winnipeg Jets True North Foundation Grant. We are happy to welcome these schools as new MYRCA voting schools for 2013! Brant Argyle Ecole Saint-Malo Joe A. Ross School New Era Oscar Lathlin Ralph Brown Roblin Elementary Wellington School Westgrove Weston West St. Paul School October 18, 2012 Now available on YouTube – a video presentation of trailers of the MYRCA 2013 nominees created by students from Acadia Junior High for the MYRCA 2012 award ceremony on September 28, 2012. Friday, September 28, 2012 MYRCA 2012 Award ceremony – MYRCA teams up with the Thin Air Winnipeg International Writers’ Festival at MTYP to celebrate Susin Nielsen and her MYRCA 2012 winning novel Dear George Clooney Please Marry My Mom. Attendance at the award ceremony is by invitation only and is limited to Manitoba young readers who participated in the current year’s vote. Thin Air is featuring Susin Nielsen in its school programs. Tuesday, September 25, 2012 The Winnipeg Children’s Literature Roundtable invites you to attend its annual MYRCA dinner with guest speaker author Susin Nielsen. Please see attached flyer. Everyone is welcome to attend. Monday, June 18, 2012 MYRCA is one of 44 local children’s charities to receive a grant from the Winnipeg Jets True North Foundation Stay tuned for project details and participants. Tuesday, May 8, 2012 MYRCA announces it list of MYRCA 2013 nominees.